WILLIAM M. EVARTS. 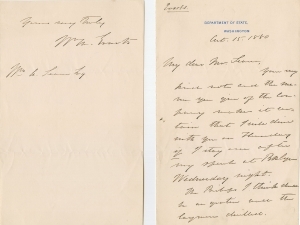 Autograph Letter Signed, to William A. Seaver, Washington, DC, October 15, 1880. 2 pp., 4⅞ x 8 in. Your very kind note and the menu you give of the company makes it certain that I will drive with you on Thursday if I stay on after my speech at Bklyn Wednesday night. The General Convention of the Protestant Episcopal Church met in New York City from October 6 to October 27, 1880. Seaver invited Evarts to attend. Evarts was already planning to be in New York that week. On Wednesday, October 20, 1880, he gave an address to the Brooklyn Young Men’s Republican Club regarding “the Southern question,” the tariff, and labor problems. He supported the presidential candidacy of Republican James A. Garfield over Democrat Winfield S. Hancock as a successor to President Rutherford B. Hayes, who did not run for reelection. Evarts had been instrumental in urging Congress to accept France’s 1877 offer of the Statue of Liberty, and in passing a bill that allocated funds for the construction of the pedestal. In addition to serving as Secretary of State, he directed American fundraising efforts as chairman of the American Committee of the Statue of Liberty, and spoke at the dedication in 1886, when Frédéric Auguste Bartholdi’s statue was finally inaugurated in New York Harbor. William M. Evarts (1818-1901) was born in Massachusetts and graduated from Yale College in 1837. He attended Harvard Law School and was admitted to the bar in 1841. He married Helen Wardner in 1843, and they had twelve children between 1845 and 1862, all born in New York City. In 1849, he became an assistant United States attorney for the district of New York, a position he held until 1853. He supported William H. Seward’s presidential aspirations and chaired the New York delegation to the Republican National Convention to Chicago in 1860. During President Andrew Johnson’s impeachment trial, Evarts served as Johnson’s chief counsel. Evarts served as United States Attorney General from July 1868 until March 1869. He returned to private practice in New York, where he served as the first president of the New York City Bar Association from 1870 to 1879. In 1872, he was counsel for the U. S. before an international tribunal in Switzerland regarding claims against Great Britain for ships destroyed by the CSS Alabama and other Confederate ships that were built in and sailed from British ports during the Civil War. From 1877 to 1881, he served as Secretary of State under President Rutherford B. Hayes, and represented N.Y. in the U. S. Senate from 1885 to 1891. Harper’s Weekly (New York, NY), January 27, 1883, 51:3.